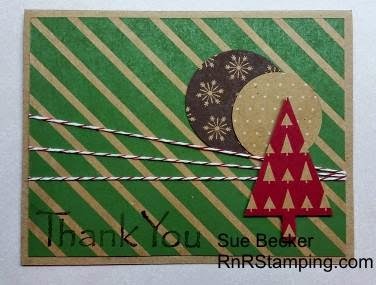 RnR Stamping: Quick and Easy Thank You, Tips for Writing Thank You notes and Blog Candy! Quick and Easy Thank You, Tips for Writing Thank You notes and Blog Candy! I was raised learning the importance of being grateful and writing notes of thanks for gifts, experiences and overall appreciation is something I've always done. I have coached my son to do the same and I have to say, the kid can write a mean thank you note! TIP: Do you struggle with writing thank you notes? Write about how you will use the gift. Was this a hard to find gift? Send thanks for the time invested in shopping for the gift. Write about how you felt when you opened the gift. How you will spend the gift card. If the gift was an experience, a sporting or performing arts event, share the best part of the event - seeing your first grand slam or seeing your favorite player, the best song in the show, the most striking piece of art, the movie you went to see and who you took with you, you get the idea! Not your favorite package? Give thanks for the thoughtfulness/generosity of the giver. The notes don't have to be long, but should be from the heart. What better way to show thanks than with a hand crafted card! I'm working on using my scraps of Christmas paper - there is a use for every piece! I cased this layout from Kadie Labadie. This card came together in a snap; Stampin' Up! punches to the rescue! You can make a stack of these in no time flat. You're thinking, ' easy for her to say'? If you need thank you notes and time is your adversary - and it is for most of us at this time of year - leave a comment below and tell me about the best gift you ever received. I'll choose one random comment and send off six of these thank you notes to the lucky recipient! Be sure to sign up to follow me by email! My posts will be sent directly to your mailbox so you won't miss out. I do need a couple Thank You cards especially this Christmas! These look fun and I like the trees! Thank you for sharing and for the chance to win! My son assigned sides of a coin, we flipped and you will be receiving the thank you notes! I had to smile when I read your comment. I remember those days of childhood excitement; that's really what Christmas is all about! Please email me your address and I'll get your cards in the mail so can use them after the holidays! Thanks so much for your comment and for visiting my blog. Merry Christmas! Sorry; I forgot to to you the best gift I ever received. It was an under the counter tiny TV/radio so I could watch TV or listen to the radio while I did all the cooking.